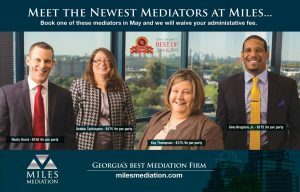 Get to know Mediator Kay Thompson, Esq. Last week Kay Thompson stepped out of her mediation, flashed a comforting smile to a group of clients waiting for their attorney in the main reception area, then disappeared to another wing of the office. We overheard one of the clients say “what a sweet woman; she just brightened the room with that smile.” It’s not certain if they knew she was a Miles mediator, but based on their response to her fleeting presence, they would’ve been pleased to know that she was an attorney and mediator, working tirelessly to bring her case to a peaceful resolution. Kay has an inviting demeanor that draws anyone in. But her reassuring presence is bolstered by strong confidence in her ability to produce results as a mediator. She has 30+ years of experience as an attorney practicing in areas of personal injury, both plaintiff and defense, malpractice defense, domestic, contract disputes, subrogation and insurance coverage, and as house counsel for State Farm Mutual Automobile Insurance Company. She has tried cases in all levels of the state court system and argued cases in the Georgia Court of Appeals and the Supreme Court of Georgia. With all this in mind, don’t you want to know more about Kay? I read “To Kill a Mockingbird” in elementary school, and I wanted to be an attorney like Atticus Finch. I have always loved to read, and an attorney career path just seemed what I should do. My dad always said I would be an attorney because I loved to argue. The mediation process gives the parties a serious shot at a resolution – one in which they have a voice and have certainty – rather than having a jury of strangers decide their case for them. Mediation is more cost-effective than going to trial – both in the expenditure of time and money. Many of the courts are overwhelmed, and mediation has an important function in helping to alleviate the caseload. Mediation gives the parties the opportunity to sit across the table from each other and hear out the opposing side – allowing them to see and hear the strengths and weaknesses of their case. It’s a tie between “To Kill a Mockingbird” by Harper Lee and “Atlas Shrugged” by Ayn Rand. My husband, Leon, is my hero. He is a man of integrity and honor. Without his support throughout 32 years of marriage, I would not have been able to practice law and raise two children. I love alternative and indie rock as much as I love classic rock and pop. An ideal weekend is spent hiking for 2-3 miles and having a picnic with family and/or friends. I am most thankful for my family and being able to retire from the full-time practice of law. The craziest thing I ever did was to get on the back of a motorcycle driven by Dickey Betts of The Allman Brothers – back when I was young and very stupid. And, no, I would not do it again. I’m lucky I’ve lived to tell it. If you were granted 3 wishes right now, what would you wish for? My 3 wishes would be to end hunger, for world peace and no hardships for anyone. The fictional character identified with – Kathy Bates’ role in “Fried Green Tomatoes – because my daughter has always loved that movie and thinks I am Kathy Bates’ twin. A superpower I would love to have is to be able to completely heal anyone with a physical or mental illness. If you could have lunch with anyone living who would it be? I would love to have lunch with Sir Paul McCartney. When in your life have you had a “now or never” moment? When I applied to take the LSAT and start the law school application process. If invisible, I would tour the entire Middle East. To find out more about Kay or to book her for your next mediation, click here. There’s no admin fee when you book a mediation with her in May and June.